Mr Ludlow gets around a bit. I’ve been sitting on this post (well, to be strictly truthful I hadn’t actually got round to writing it until early March) for a bit to let him finish his national tour of this tasting, taking in his regular haunts from London to Newcastle. The reason for keeping it under wraps was simple – like the last one I attended we tasted everything blind and with London being the first leg of the trip he didn’t want anyone to spoil it for future punters. The blind tasting had a more specific purpose this time as we’d be tasting the whisky in pairs – one distillery bottling and one from an independent. Distillery bottlings usually stick to the regular distillery character while independents often go a bit further afield, but without even knowing which distillery had produced the spirit we were tasting, would we be able to tell? Six whiskies, three distilleries – go! First up was a yellowy gold dram that we were told came in at 40-46%. On the nose there was a buttery sweetness, with caramel popcorn, vanilla sweet citrus, linssed oil and foam bananas. In the mouth it was quite oily, with a tannic wood rolling in after a burst of syrupy fruit – apples turning to liquorice root and sour wood. Water knocked out some of the sourness and brought out some of the creaminess of the caramel. Number 2 was a little darker with a nose of smoky leather, hard toffee, meaty undertones, mulching fruit, salty caramels and lemon. To taste it was thick and spicy, sweet and prickly, with unpolished leather and a sweet & sour finish. Water brought out more fruit, cut the prickle, and brought out the lemon from the nose and some vanilla – lemon drizzle cake, maybe? At the end of the night we had the whiskies revealed, but I’m going to stick them inline so as to not confuse myself. This first one was not at all what I thought – I went for Balblair (thinking that the first was their 2000 vintage) and I wasn’t particularly close. 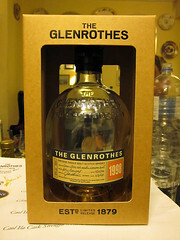 The distillery was The Glenrothes, with the first bottling being Gordon & Macphail’s 8 Year old and the second the 1998 Vintage from the distillery. I didn’t even get the OB/Independent order right… Glenrothes is owned by Berry Brothers & Rudd and they seem to be quite nice about selling casks of their spirit on to independents, appropriate as they are an independent bottler themselves. It was interesting to see the bottlings the opposite way round to usual – the distillery bottling was big and ballsy and the independent lighter and more refined. Our next distillery was revealed to be in The Highlands and the first whisky was rather light with an announced ABV of 46-50%. On the nose there wear fresh pears, pear drops, ‘watermelon nerds’ (thankyou Mr Matchett) and Imperial Leather soap. 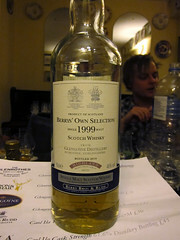 To taste it was syrupy sweet to start with apples, a prickly middle and a big dry woody finish. Water open things up, levelling the out the sweetness to leave polished wood and quite a bit of boozy prickle. Mr Matchett pronounced that it was like ‘An apple on the floor in B&Q’s wood section’. I didn’t even guess the distillery this time, but was certain that the second of the whiskies was the independent – yet again I was wrong. The spirit was made at Glengoyne, the first an independent from Berry Brothers, their Berry’s Own Selection 1999, and the second the distillery’s own 12 year old Cask Strength. The distillery is quite unique in its location, being in the Highland region but being close enough to the boundary with the Lowlands (The Highland Line) that its warehouses, over the road from the distillery building, are considered to be in the Lowlands. That has the smell of marketing to it, in my opinion, but from what I’ve heard it strikes quite close to the the distillery’s regular style – a more refined Highland spirit. However, the whiskies we tried didn’t really go that way, with both the independent and cask strength OB stepping away from that into more punchy territory. 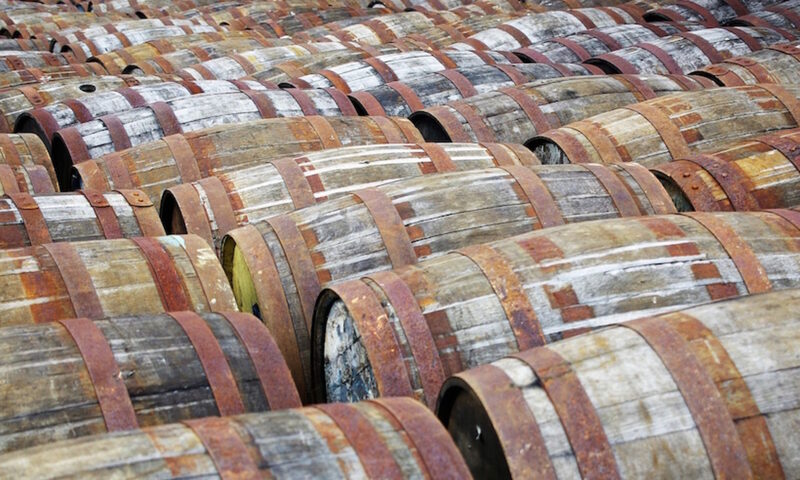 The first whisky from our last distillery was a deep bronze colour and declared to be between 55% and 65%. On the nose it was intense, with big medicinal notes, sherry, coal tar, stoniness and hints of fruit under the punch of the rest of the flavour. To taste it was very sweet and spicy, with a bit of hammy smoke (although not as much as the the nose would suggested) and big rich fruit. Water killed it dead – less sweetness and a little bit of fruit but generally less impressive. 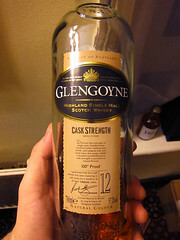 Dram #6 was rather light and had brine, light TCP, lemons and bit of mulch on the nose – wet forest in a glass. To taste it had woody smoke, vegetation, mulchy fruit and something I described as ‘smoked chocolate’ in my notes. Water revealed sweetness, with candied lemons appearing. 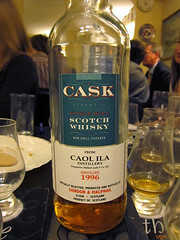 I did cheat a little on this one as I was on a table with Colin Dunn, Diageo whisky brand ambassador, who could barely contain his usual excitement and may have let slip that he’d supplied one of the whiskies – a Caol Ila. This left us to decide which was which, helped slightly by Colin’s typically exuberant arm waving and surreptitious “this one’s ours” comments slipping out ‘accidentally’. 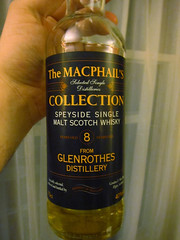 First up was Gordon and Macphail’s 1996 Cask Strength, put together from three refill sherry butts, and the second was the distillery’s own Natural Cask Strength bottling. Our only Islay of the evening and one of my favourites – while I preferred the first without water, with its light approach to Caol Ila’s traditional flavours, the second had the punchy peaty smoke that is slowly returning to my list of likes. Speyside single malt Scotch whisky, 40%. ~£20. Highland cask strength single malt Scotch whisky, 57.2%. ~£40. Islay cask strength single malt Scotch whisky, 59%. ~£40. 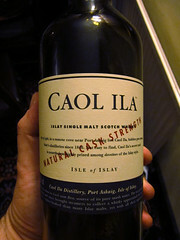 Islay cask strength single malt Scotch whisky, 61.6. ~£40.